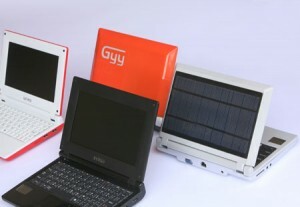 Spanish company iUnika has announced the release of 4 new low power netbooks, starting at 130 Euros (about $181 or £115). Although no firm release dates have been released, the iUnika Solar model charges via solar power and will sell for around 160 Euros ($225 or £140). The netbook weighs around 700g and carries a 400MHz processor. iUnika are firmly committed to free software and so the laptops will run a Linux operating system with plenty of Linux applications. The screens are just 8 inches, with a resolution of 800 X 480 pixels. Other specifications include 10/100 ethernet, Wi-Fi, up to 64GB of flash memory and a low 128MB of RAM. Additionally, the laptop itself is made from bioplastics and other biodegradable materials derived from starch and cellulose.